How many times have I said …”I just want to be happy”…..in my head? Even though I know this is a futile thought…even silly, it is still there…floating around…like a albatross around my neck. My brain knows that being happy is a relevant term, one that is a mind-set not a way of life. My spirit knows that it rains on the just and the unjust…(its in the Bible….for pete’s sake!)) as well as living proof all around me. Who do I think I am to ask for happy? I can throw a rock and hit some other soul that would and has given their very lives for a moment with all their legs or hands or even someone they love back with them. The conviction runs rampant through my heart…I know I am behaving badly here. But today I am there….at one of those points of just sadness…..feeling all alone in the middle of a crowd. is one of my specialties also…along with tears and fear. The tiredness of it all is palatable…groaning inside me, my heart aches. Lord give me that sign….the George Bailey…..the good ole Hail Mary pass. The reminder that no matter how hard life gets….it is still better than the alternative…never being born at all. of family members and the absence of others, the attempt to be cheerful is a broken down cliché. But I do know that thankfully I will not always be happy….everyday of my life. Actually that would be frustrating and positively obnoxious to anyone around me. I would hate me!! One thing I do know for sure is that JOY is the goal…along with PEACE and most of all HOPE. 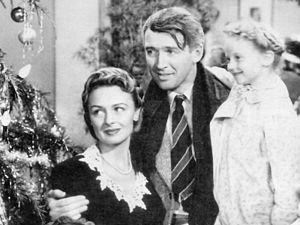 I do have HOPE…..and just like George Bailey from “It’s A Wonderful Life, I too am full of hope that I know will get me thru these rough patches in life. Although my heart remains heavy, my spirit can rest in the knowledge that….”with God all things are possible!”..Matthew 19:26 and just like the virgin Mary found out so many years ago, each of our lives are here for a purpose….for such a time as this, Esther 4:14. The LOVE of God is everlasting and the happy follows and flows like a river…sometimes there are rocks and a wood chuck builds a dam or it is a hot year and it nearly dries up…these are the times and seasons for us all to endure and be happy in the wisdom of those who have come before us. Had they been as whinny as me, nothing would have ever gotten finished. So I say with all gratitude, thanks be to GOD for my life and I will attempt to live with more joy…even when I don’t wanna!!! We are kindred spirits! I have been in an abyss for a long while now but I am coming up on the victorious side of the mountain now! Decided that digging more in Gods Word and reaching out to others would make me center myself in Jesus once again! Sometimes I am crazy selfish & stingy with my time & family. Christmas is coming and being hope-filled at this time feels better than my sadness. We should pray for each other along with our responsible praying for those for whom we care each week at our churches. Blessings at this season. You are in my prayers sweet one…..life is hard and seems to not let up….but we know from where the help comes….look up! Lookout! Vacation story with pictures!